Teachers and parents are agreed: Creativity needs to be infused more deeply into the curriculum. However, according to a new study, testing, federal and state mandates, and a dearth of time and resources, among other factors, are getting in the way. The study, "Barriers to Creativity in Education: Educators and Parents Grade the System," surveyed 4,000 K-12 and higher ed teachers and parents of students in the United States, Germany, Australia, and the United Kingdom to compare attitudes toward creativity in education. It was conducted by Edelman Berland and commissioned by Adobe and released to coincide with the ISTE 2013 conference, taking place this week in San Antonio, TX. In the United States, both teachers and parents overwhelming indicated their support for creativity in the classroom and the need to make changes to the curriculum and to priorities at the administrative and policy levels. This is contrasted severely with the attitudes of educators in Germany (65 percent agreement), Australia (67 percent), and the UK (67 percent), though parents in those countries did show stronger agreement (around 85 percent in each country). In fact, American teachers and educators were strongly aligned in most of their attitudes toward creativity in education, coming within one to five percentage points in every case, while parents and teachers in the UK, Germany, and Australia showed a significant disconnect in their attitudes on almost every issue raised in the survey. For example, in the United States, 89 percent of educators and 87 percent of parents agreed that teachers can do more to teach creativity. In the UK, there was a 21-point split between parents (86 percent) and teachers (65 percent); in Germany a 16 point split (87 percent agreement for parents, 71 percent for teachers); and in Australia a 15-point split (85 percent parents to 70 percent teachers). "We were surprised by the strong alignment between parents and educators around the importance of teaching creativity for the future economic growth as well as the current barriers to teaching creativity," said Tacy Trowbridge, worldwide manager of education programs at Adobe. "This survey confirms what we hear from individual educators about how essential it is that educational systems value creativity, that educators teach innovation and creative skills, and that we adequately prepare educators to include creative skills in all fields. We had expected to see differences in responses from educators in K-12 and Higher Education as subject matters becomes more specialized. We were surprised by their broad alignment at least at a high level. This is an area we would love to explore in more depth." They also agreed (85 percent teachers, 87 percent parents) that in order to teach creativity, educators must be given more tools and techniques. Creativity is not something that can be assessed under the current education system (69 percent parents, 71 percent educators). When asked to name the single greatest barrier to creativity in education, the most common response for U.S. teachers (21 percent) was "an education system that is too reliant on testing and assessment." In second place for educators was a lack or resources (14 percent); in third was the concern that educators are restricted from "straying outside the curriculum" (12 percent). "Heavy state and federal mandates that hinder creativity" was fourth at 11 percent. Tying in fifth place as the single most significant barrier for educators were the current education curriculum and a lack of tools and techniques (10 percent). A lack of resources (9 percent), which tied with a misunderstanding of the importance of creativity in education. The survey also asked respondents for the single most important step that must be taken to promote and foster creativity in the classroom. 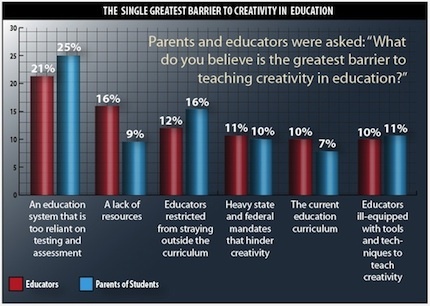 The strongest support went to providing tools and techniques for educators to teach creativity, at 31 percent for parents and 28 percent for teachers in the United States. That was followed by making creativity integral to the curriculum (22 percent parents, 26 percent teachers) and reducing mandates that hinder creativity (16 percent parents, 20 percent teachers). Improving the curriculum (14 percent parents, 16 percent educators) and rewarding educators who inspire students to be creative (17 percent parents, 10 percent educators) rounded out the top 5. "Currently, as students move from K-5 to grades 6-12 and on to higher education, creativity is increasingly treated as a specialized skill," Trowbridge said in a prepared statement. "Educators and parents see that the demand for creativity and creative thinking is growing — to solve complex problems and to drive future economies — yet students are less prepared to lead the innovation of tomorrow." Among American educators surveyed, most (54 percent) indicated that the role of creativity in education has changed in the last 25 years, and a larger majority (68 percent) said the role of creativity will be greater in education in the next 25 years. Further details are available on Adobe's education portal.